After playing with the new iPad Pro 10.5″ for a few days, I am convinced that it’s fairly impossible to do a detailed review of it in its current state. Not because there is some sort of flaw, but because it was clearly designed top to bottom as an empty vessel in which to pour iOS 11. Every feature, every hardware advancement, every piece of understated technical acrobatics is in the service of making Apple’s next-generation software shine. I know this isn’t really helpful to those of you who have or wish to buy the device when it drops on Tuesday, but don’t worry, I can save you all of that flim flam. This is an amazing iPad . It pays off years of setup in ways that come home when you see how well iOS 11 works. Last year, Apple’s Tim Cook said that “we believe that iPad is the perfect expression of the future of computing.” This year, that claim seems more ideologically sound than ever. Think of every iPad up to this point as a glass of water set on a shelf — in wait for some future moment of need. This iPad is Apple’s “swing away” moment. It executes on the years of insistence that the iPad is the future of light work computers. But that moment is only telegraphed, shadowed, until you see it through the lens of iOS 11. So instead of a full review today, I’m going to talk about some of the marquee features of the iPad and how Apple was able to execute on them. And yes, whether they live up to the marketing blitz hype. Then, we’re going to install iOS 11 on it and work it hard until we can talk about how the two halves of this whole play out. If you’ve been following the way I write about Apple releases over the past couple of years, you also know that I’m leery of delivering a full-on “review” just a few days in. First things first, the size is great. With a 20 percent larger screen but an increase in physical size of only 7 percent, the sweet spot has been well and hit. The larger 12.9-inch size will stick around, but I’d expect to see all other iPads at 10.5 inches at some point. It’s just the right size. The bezels are small but not invisible, which is important for a device that you need leverage to hold in your hand. At this point, Apple has pretty much given up on the “limited screen sizes for developers to build to” approach. It gave people building for iPad about three years to start thinking in this new resolution-independent way that allowed apps to scale to any size, and now it’s stepping off the ledge. There are currently a bunch of screen sizes in Apple’s lineup and the message is clear: however big or small it needs to be, that’s what we’re going to do. Of course the bigger size means you get some more physical space. So rather than stretching out the pixels on the display, Apple just increased the number of them, resulting in the exact same density. Basically, this looks as sharp as the 9.7-inch iPad Pro — just bigger. 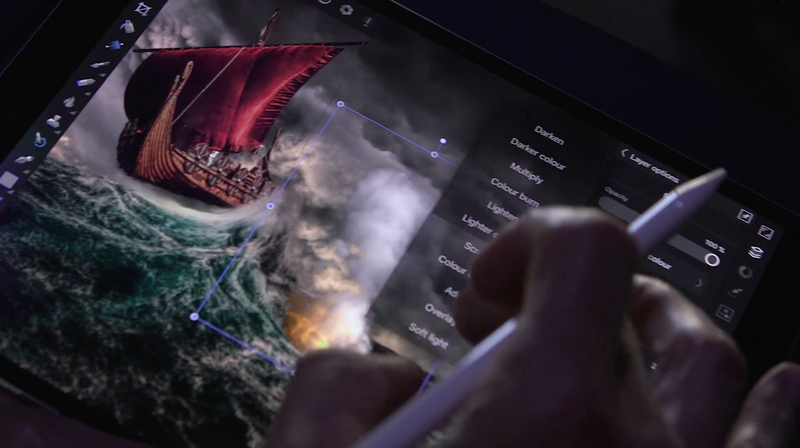 This means a larger work area for drawing or editing apps, but, in my experience, isn’t a big enough change to have a significant impact on the experience of working on apps like Paper or Final Cut from the smaller iPad. If you want that feeling of expansive work area and access to more hidden pallets directly, then go all the way to the 12.9 inches. The big gem here is the quality of the screen. Apple has bundled together its P3 color gamut and True Tone technology into a single category called Promotion. You can take a look here; they really are fantastic. But this generation adds a significant enhancement into the same group — the ability to scale the refresh rate from 24Hz on the low end to 120Hz on the high end. This allows the screen to refresh up to 120 times per second if you’re looking at fast-moving content, or down to 24 times per second if you’re staring at a static page. Obviously when it’s cranked up to the max it uses a ton more battery, but when it’s down low, while reading for instance, it’s sipping power by comparison. This makes an enormous difference while scrolling, as it refreshes as fast as you can possibly scroll it, making for a smoother look with less stutter. 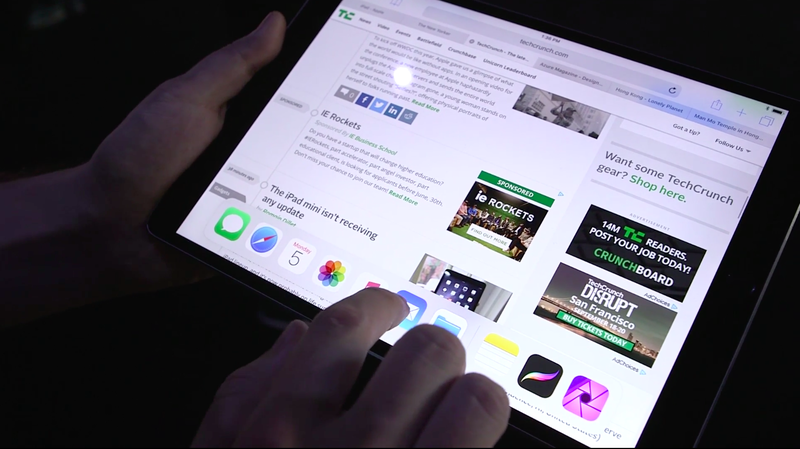 iOS has always had a leg up when it comes to buttery scrolling, but Promotion takes it beyond. Content feels like it sticks to your finger or flies by when you fling it. There is also a massive bonus when it comes to the Pencil. Because it’s sampling 120 times per second, it’s able to make the Pencil appear even smoother, with the tip following the draw point precisely. Apple says that the latency (delay) of the pencil is down to 20 milliseconds, but with the higher refresh and some additional behind-the-scenes predictive magic, it can actually get down as low as a perceived 8ms, which is insane. 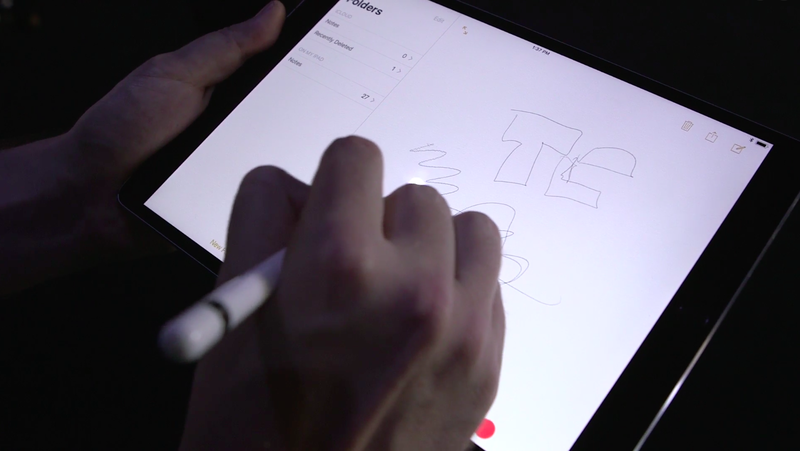 The Pencil quite simply offers as close to a paper experience as you’ll see on any commercial tablet anywhere. The supporting silicon of the A10X chip allows Apple to deliver not just the best tablet screen, but one of the best displays in all of computing at the moment. It really is a cut above. This variable refresh rate makes it rather hard to measure battery accurately — about the best you can do is to try to run tests on a single kind of content and then average them out. I was only able to do some cursory testing but so far the measure of 10 hours seems super conservative unless you’re watching a ton of high frame rate video. I regularly got 12-15 hours out of it in normal, mixed, use. Accessory wise, by the way, the keyboard is the same material, feel and build (and they all work on all sizes). The new leather cases are really well made, though. Apple has come a very long way when it comes to leather working and materials smarts in these cases. Its early crude watch bands and cases pale in comparison to these. The camera hardware is the exact same package as in an iPhone 7, which is to say it’s the first time that a front and rear camera on an iPad has been on par with iPhone and quite good at that. The side effect of having the amazing front camera in it and the larger screen is that you end up with the most badass camera viewfinder ever. It’s important to note that the overall feel is what’s important, in the end, the result of all of these bumps in power and precision. I’m happy to report that it feels smooth and capable and like it’s running with overhead to spare. Even at 4GB of RAM, I never had much trouble splitting the screen or bopping around between apps. Never a single lag in the Pencil or during heavy sessions in Affinity Photo. And I wrote this piece entirely on the iPad Pro; aside from the 103 degree fever I’m running at the moment (thanks kids! ), it was painless. Science fiction for has decades displayed tablets as the future of mid-range computing. (Of note: many of them show heavy use terminals still need a keyboard, which feels right). And it makes sense. In a world of artificial intelligence, greater mobility and voice-first systems, an always-attached keyboard feels silly and archaic for the majority.